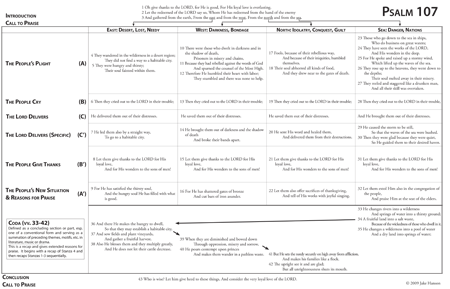 (Note: Feel free to download my well-received chart which explains the structure of Psalm 107. As suggested below, this structure is crucial to understanding the meaning and significance of this wonderful Psalm. Feel free to print for your own use. It is copyright material). For my commentary and exegetical analysis of this Psalm, please go to "An Exegetical Analysis of Psalm 107." Oh give thanks to the LORD, for He is good, For His loyal love is everlasting. Let the redeemed of the LORD say so, Whom He has redeemed from the hand of the enemy And gathered from the earth, From the east and from the west, From the north and from the sea. Most of us have Psalms which are important for us, not because they are necessarily meaningful to us, but because they remind us of someone we care about. Psalm 107 reminds me of my grandpa. None of you, except my family here, has met my grandpa. But if you had, you would have liked him—I promise. He had a gentle, humble, yet forceful spirit. If you had met him, in just ten minutes, he would have told you in his simple, broken English and German accent, about how as a young immigrant to the United States in the 1920s, he indulged in the excesses of the Roaring Twenties. He was a heavy drinker and smoker and only God knows what else. One day, he attended a small church service, and he called upon the name of Jesus for salvation, and he was saved, and he was also delivered from alcohol and cigarettes. The Lord had done a miracle. He ran out of the church and began to proclaim on street corners what the Lord had done, and he would tell for 75 years about how everything was different—even the sky and the trees looked new. This is what we see happening in Psalm 107. If you would look with me at the chart I have handed out, on the left side of the chart, you will find what is the very heart-beat of the worshipper, and the pulse of the one who gives thanks to the Lord. It begins with a description of the situation of danger and difficulty which the people were in. Then the people cry out to the Lord for deliverance, and the Lord delivers them. You will notice that the work of the Lord is stated twice, and is the central focus which we must be drawn to. It is the Lord who has done this, and not us.